Ingesting 2 to 4 tablespoons of coconut oil added to foods or simply taking coconut oil will cure many "incurable" diseases [web11]. Free radicals (pollutants) are eliminated by antioxidant properties [web11]. The immune system is strengthened [web11, web19] [coconut oil in tea]. Coconut oil can be added to the food (sauces, soups, rice, cereals, etc.) or drinks (juices, teas, coffee, mineral water, etc.). -- add coconut oil as an ingredient in juices, salads, in the tea, can be used for cooking for fried food [web03]. The lauric acid in coconut oil needs no bile and no fat-splitting enzymes for being processed in the metabolism. Therefore, the coconut oil is very easily digestible [web11]. In Ayurvedic teaching [in India] oil extraction of coconut oil has been used for millennia [web16]. The indigenous peoples of Indonesia and of other tropical regions used coconut oil as a cure for wound healing [web09]. "In recent decades, new evidence has shown the specific antiviral effects of even dangerous viruses such as herpes simplex virus, measles and even HIV - AIDS! (original German: "In den letzten Jahrzehnten zeigten neue Erkenntnisse die spezifischen antiviralen Wirkungen auch bei gefährlichen Viren wie das Herpes Simplex Virus, Masern und sogar HIV - Aids! An Alzheimer's brain can convert glucose into energy only insufficiently. Coconut oil, however, forms ketones that can be converted into energy by an Alzheimer's brain. Thus, Alzheimer's disease is delayed or even reduced [web07]. Woman doctor Mary Newport has written a book about coconut oil telling about her husband with his Alzheimer's cure: Alzheimer's Disease: What If There Was A Cure? During 1 year daily, 2 tablespoons of coconut oil in the morning and 2 tablespoons of coconut oil in the evening were given, the husband's Alzheimer's improved substantially to almost 0% [web17]. The brain consists mostly of saturated fats. Cholesterol is needed as fuel for the communication of neurons. It has been discovered that seniors with high cholesterol live longer without dementia than people with lower values. The whole blabla of Pharma against cholesterol is WRONG. And coconut oil in the diet actually reduces Alzheimer's [web02]. "US" New York doctor Mary Newport cured her husband Steve from his Alzheimer with coconut oil. He had lost much of his memory, did not find the silverware anymore, did not know how to open the fridge any more, did not recognize people anymore, could barely speak, forgot agreements, and could not count anymore. Alzheimer's drugs had massive side effects with depression and weight loss [web17]. The experiment with coconut oil began in 2008 [web18]: With 2 tablespoons of coconut oil in the morning and in the evening, the condition improved significantly after only 2 months (60 days): mental clarity, humor, and he was able to speak normally again. After 1 year he was almost healed: he recognized people again, was able to talk normally, he could solve tasks [web17]. After 2 years, a setback came by a blow from a fall. He died on January 2, 2016 at the age of 65 [web18]. "Woman doctor Mary Newport, a medical doctor from England, said that she cured her husband with Alzheimer's coconut oil. Her case can not be disproved. Unfortunately, coconut oil is not a miracle cure for Alzheimer. Alzheimer is provoking that the brain can no longer convert the sugar it receives into energy. As a result, it is not sufficiently supplied. This condition can be corrected by adding ketones. Ketones can be obtained, inter alia, by MTC [middle-chained triglycerids] being present in large quantities in coconut oil. Cancer develops more likely in an inflammatory climate, so certainly not with coconut oil - coconut oil against cancer: One can perform a "ketogenic purification". You go for a cure, take as a drink only water with coconut oil, with special antioxidant additives and other components of a bowel cleansing program (3-10 days). Coconut oil forms ketones in the liver, this is a "ketogenic cleansing" with a blood sugar value of less than 55 to 56 mg / dl. Glucose is not needed, so the cancer cells starve to death [web26]. -- Cancer cells are killed by hunger with a "ketogenic purification", healthy body cells are supplied with the ketones as fuel [web07]. Take two teaspoons of coconut oil every three hours (a total of 8-10 teaspoons a day) - ideally organic coconut oil. Drink approximately 3.8 liters of clear water with antioxidant additives (eg fresh lemon, curcumin, chlorophyll, (eg in the form of wheatgrass or barleygrass powder), apple cider vinegar, etc.). Curcuma can also be taken in capsule form. Pay attention here to the proportion of black pepper extract, which increases the bioavailability of curcumin to a multiple. The antioxidant additives protect the mitochondria in the healthy cells from free radicals and - as free radicals can contribute to chronic inflammation - also against inflammatory processes. Use natural herbal supplements to cleanse your bowels and build your intestine flora. A high quality bowel cleansing program exists z. B.
Arteries and blood vessels are strengthened by coconut oil and protected from injury, so arteriosclerosis is prevented, constrictions are prevented, hypertension is prevented [web11]. With the ingestion of coconut oil, heart disease is prevented, coconut oil is a super prevention [web11] by eliminating deposits in the circulatory system [web26]. Inflammations of the heart such as endocarditis (inflammation of the heart's lining) are cured with coconut oil [web24]. The studies on coconut oil and heart disease lasted over 40 years. Coconut oil minimizes the risk of heart disease. Coconut oil does NOT alter cholesterol in healthy people (study by Kaunitz & Dayrit 1992, study by Kurup & Rajmoran 1995). Coconut oil also does NOT provoke heart disease or increased mortality (study on South Sea Islands by Prior et al 1981, study by Kaunitz & Dayrit in 1992 with indigenous people using coconut oil in their diet) [web07]. On the other hand, when indigenous people in Sri Lanka switch from coconut oil to corn oil, negative changes occur, as LDL cholesterol falls, but HDL cholesterol (good cholesterol) also falls [web07]. When indigenous peoples from the South Sea migrate to New Zealand and coconut oil consumption decreases, harmful LDL cholesterol is increasing and good HDL cholesterol is decreasing [web07]. When young, healthy men ingest coconut oil, good HDL cholesterol is increasing. When taking soybean oil, the good HDL cholesterol is decreasing (study by Mendis & Kumarasunderam 1990) [web07]. Overall, sweeping Western fatty acid propaganda in the Western world provokes the abandonment of coconut oil by the western populations - but there is the increase in heart disease and dementia in the population (Analysis (Review) by Lawrence, 2013). Thus, it is clear that coconut oil SAVES people from heart disease and dementia [web07]. Coconut oil heals complex diseases: allergy, asthma, autism, migraine, cysts etc. The medium-chain fatty acids in coconut oil can be easily processed, WITHOUT the use of blood sugar (glucose). So much less insulin is needed to proceed the glucose in the blood [web16]. Diabetes [web11]: Coconut oil improves the secretion of insulin for the utilization of blood sugar [web19]. Coconut oil improves the release of insulin [web11], coconut oil improves the secretion of insulin for the utilization of blood sugar [web19]. Coconut oil is easily digestible and thus provokes an energy boost due to its easy digestibility without bile and the medium-chain fatty acids. Coconut oil is easily absorbed in the liver and converted into usable energy. There is stimulation of the metabolism - and fatigue goes away [web19]. -- that many diabetics can heal their eye damage (diabetic retinopathy with deficient circulation and nerve damage) [web06]. Symptoms include: itching, burning of reddened eyes, milky secretions, swollen lids or bags, encrusted eyelashes. Eye infections can sustain provoke damages for ever [web14]. Soak a piece of lint-free cotton cloth in warmed, liquid coconut oil and carefully rub the closed eye with it, from the outside inwards towards the root of the nose. Repeat this several times. Then keep your eyes closed for several minutes and let the coconut oil penetrate. If both eyes are affected, use a different part on the cloth or another cloth. After 10 minutes, an oily veil is hindering the vision, but this disappears after a short time. Repeat the process several times a day. The eyes are soothed, the conjunctiva heals, itching goes away. The recovery comes after a few days. Never rub your eyes with your fingers, and only clean your eyes with a clean cloth [web14]. Coconut oil cares also eyelashes [web11]. 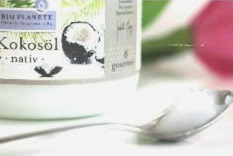 -- mix 1 teaspoon of cold-pressed coconut oil with 1 cup of almond milk, take before sleeping [web03]. Coconut oil in beverages is nourishing the intestinal flora [web13 - Reader's voice Nadine]. -- Researchers gave an annual conference in Chicago "Digestive Disease Week"
-- Coconut oil can be integrated into the normal diet and intestinal inflammation is reduced [web01]. Affected people just have to replace in their food the "bad fats" by the "good fats", replace the previous oil with coconut oil and cocoa butter and already alleviate the Crohn's disease symptoms. Every patient has to try out how to respond to coconut oil and cocoa butter. Drugs with side effects can be reduced or even rejected for ever [web01]. 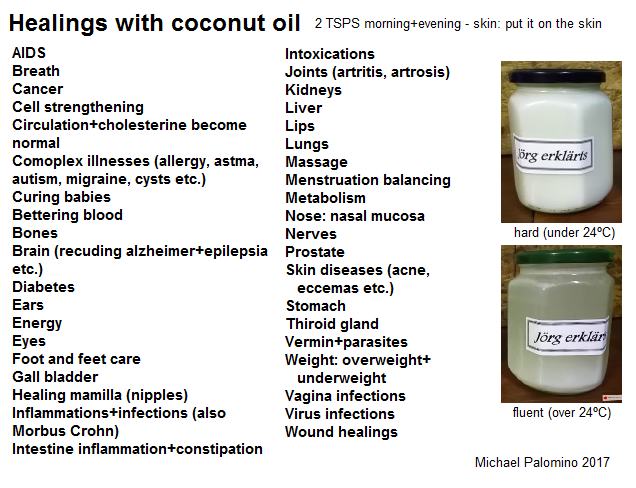 -- Coconut oil is ideal with healing properties for massages, for example foot massages [web13 - reader Birgit]. "In order to stimulate metabolism, coconut oil should be consumed daily and the oil pulling done every day.The oil pulling with coconut oil increases metabolism and stimulates detoxification processes in the body. For oil pulling take 2 teaspoons of coconut oil in the mouth and rinse it for 20 minutes. -- Overweight: metabolism is stimulated and unwanted fat is reduced [web19]. Metabolism is normalized, this promotes energy supply and movement in life, coconut oil is not stored as body fat, but is directly converted into energy [web11]. -- Overweight: The saturated fatty acids of coconut oil are reducing the feeling of hunger [web19]: As insulin levels do not fluctuate with coconut oil, cravings and obesity are also prevented [web26]. "Unexplained weight gain is one of the most common symptoms of hypothyroidism and thyroid hormones have a direct impact on the metabolism. The medium-chain fatty acids in coconut oil are very helpful in weight loss. They increase the feeling of satiety, they protect from voracious hunger feeling and they help to reduce belly fat. They support the detoxification process of the liver, which removes toxins from the belly fat. Mix 1 tsp cinnamon + 2 tsp honey + 1 tsp coconut oil - belly fat is gone! - total skin care [web27]. Coconut oil heals the thyroid gland [web11]: thyroid dysfunction is cured [web19]. "Coconut oil also has a strong influence on the thyroid gland, especially the medium-chain fatty acids in coconut oil have a very positive effect on hypothyroidism. In thyroid hypofunction, or hypothyroidism, the thyroid gland does not produce enough hormones to disrupt normal metabolic functions. Frequent consequences include lack of energy, increased sensitivity to cold, constipation, general weakness, heavy menstruation, brittle hair, weak nails, dry skin and difficulty in concentration. Hypothyroidism should always be treated causally. A malfunctioning immune system, daily habits and diet have a strong influence on the thyroid gland and may be the cause of hypothyroidism. Coconut oil helps to treat various problems that are related to hypothyroidism. Thyroid hormones have a strong influence on the metabolism. With a hypothyroidism, the energy from the food is no longer used properly, chemical reactions in the body are no longer properly regulated and the health of cells, bones and muscles is disturbed. The medium-chain fatty acids in coconut oil easily penetrate into the mitochondria of the cells, where the fats are converted into energy. This stimulates the metabolism and increases the basal body temperature. " "Hyperthyroidism is often associated with muscle and joint pain due to the low level of thyroid hormones, which causes an increase in inflammation in the body. Coconut oil stimulates the production of thyroid hormones and promotes normal gland function. It also acts anti-inflammatory and supports the healing process of tissues. Vaginal infections are eliminated with coconut oil [web07]. Coconut oil is generally acting against vermin in a very dehydrating way and dries out the vermin. The chitin protective armor is SOLVENTED by caprylic acid and lauric acid in coconut oil and the vermin dies. Caprylic acid is therefore like a natural insecticide. Rub the affected person with 1/2 teaspoon of coconut oil [web10]. Parasites are eliminated [web11]. You can increase the effect by adding 1 teaspoon of coconut oil 1 to 2 times a week, or eat also coconut flakes. Health and energy are also improved [web10]. Rub yourself with coconut oil before a walk etc. If bites are already present due to vermin, coconut oil heals quickly and the itching is alleviated. For protection you can pull stockings over your legs or protect the area with a bandage. Ear mites can damage your hearing permanently. Loose mites can be removed with a cloth soaked in coconut oil [web10]. "Small wounds heal faster when coconut oil is applied to the wound and surrounding area" [web04], like an ointment [web09]. The scars heal faster, better and with much less pain when rubbed regularly with coconut oil [web09]. The skin area is simply treated several times a day with a little coconut oil [web09]. It forms a protective layer against all pathogens [web11]. Coconut oil taken by food or drinks also heals internal injuries in the body [web11]. -- smear hands with coconut oil [web09]. Treatment: Rub your hands in the evening with coconut oil and wear thin cotton gloves at night. The coconut oil can penetrate deep into the skin and accelerate the healing process. In the morning you can also make a hands massage with some coconut oil. In winter, you should never work without gloves when there is much work with water [web09].